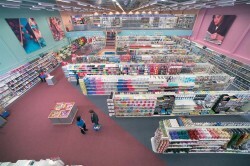 Hobbycraft are one of the leading arts and crafts retailers in the UK and when they decided to expand their company, they turned to Hampshire Mezzanine Floors. Hobbycraft instructed HMF to design build a number of new stores as well as refurbishing some of their existing stores. HMF completed the successful implementation of 21 new Hobbycraft stores as main contractor running everything from Building Regulations, Planning & design, right through to the hand over of the completed store ready for merchandising by Hobbycraft personnel. 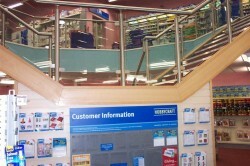 The projects included retail mezzanine floors with glazed balustrading. The complete store fit out involved mechanical and electrical installations, which included retail lighting systems, power &data. 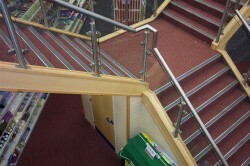 Each store had a new passenger lift fitted in the front of house area and also a goods lift where applicable. HMF undertook the refurbishment of 9 of their existing stores with the addition of mezzanine floor extensions, again with full mechanical and electrical installations, flooring & decoration. Partitioning systems included steel stud and full height jumbo stud as well as dry-lining. The mezzanine floors were 1 hour fire resisting with 1 hour column casings painted out to match the decor of the stores and also had a 1 hour fascia which was plaster skimmed & decorated to the front of the mezzanine. The suspended ceiling systems below the mezzanine floor were also 1 hour fire resisting. HMF also set out the store gondola layout and provided the image and sound systems with designated specialist sub-contractors for the store. The projects were built on a tight programme and were all completed on time.